This was the second year of a projected three-year project. Volunteer records increased during the year, and one hard-working individual provided records of over 40 new sites. There was also a constant stream of information from other volunteers who were invaluable in reporting the visibility of submerged peats and features usually covered by sand. Promotion of the project continued through dedicated introductory meetings and presentations which were held at Harlech and Llanfairpwll, and awareness of the project was raised at talks given on other Trust projects. Two excavations were conducted during the year. The first took place in January 2011 at Penychain, Abererch. Flints had been reported eroding from this area since the early 1920s but the site was brought back to our attention through the Arfordir project. Six test pits were excavated with the aid of a volunteer, five of these contained worked flint and showed signs of a ground surface covered by sand encroachment. 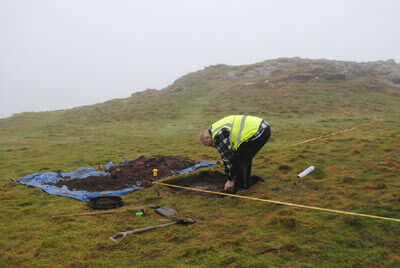 A second excavation in February aimed to determine if an orthostat, found eroding from dunes at Morfa Abererch in 2004, was a prehistoric standing stone or later feature. The excavation of a single test pit against the stone showed that it stood over 2m tall and was almost certainly a Bronze Age standing stone. Unfortunately the test pit had to be abandoned due to safety concerns before the cut of the stone hole or base of the stone was identified. A large number of previously unrecorded features associated with HMS Glendower which later became Butlins Pwllheli were recorded on Penychain (a rocky headland) and the long beach at Morfa Abererch. Features associated with both the WWII and with the establishment of the holiday camp were recorded. The former included a large number of concrete plinths and gun emplacements, and the latter included locations of cable cars and miniature railways which were a part of the Butlins holiday camp complex. At Glanllynnau, Llanystumdwy, a previously unknown area of submerged peat and a probable fish weir were reported by a volunteer working as part of the project. When the area was visited to confirm the discovery the eroding edge was examined for affected archaeology, and a feature containing high quality flint and prehistoric pottery was discovered eroding from the shoreline. At Godreddi Bach, Red Wharf Bay, Anglesey, a WW2 pillbox disguised as a cottage which is currently used as a garden shed and associated concrete platforms were reported by the current owner who had attended an introductory session. The site was fully recorded by the owner who included historic photos which showed the pillbox with its original false roof in place. A granite quarry site at Porth Namarch, Holyhead which is largely only visible from the sea was reported by a volunteer who often sails around the coast of Anglesey. 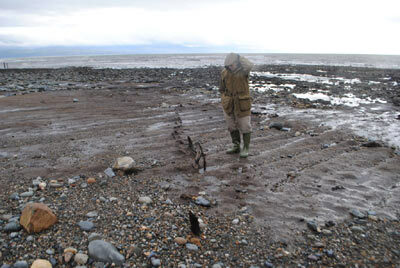 Further investigation on shore revealed the presence of grinding stones and other features. The monitoring walks undertaken by GAT over the course of the year resulted in the discovery of 24 new archaeological sites and over 35 artefacts were recovered from eroding edges. As well as the training provided in rapid survey methods a request was made to assist in the recording of artefacts. 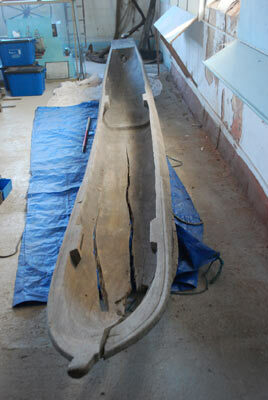 A session was held at Nefyn Maritime Museum where volunteers had the opportunity to assist in the recording of a log boat, gaining experience in drawing plans and sections and photographing artefacts. The history of the boat itself is interesting as it was apparently found on a sand bank in the Menai Strait, investigation suggests that the boat originated in West Africa and had probably been brought to the area as a souvenir. Exactly how it ended up in the Menai Strait remains a mystery. A Total Station survey was conducted at Penychain, to include the erosion of prehistoric surfaces and WWII features. A handheld GPS survey was conducted of exposed peat, glacial clay and associated features in the area of the standing stone excavation at Morfa Abererch and of the peat exposure and newly identified fish weir at Glanllynnau, Llanystumdwy. Information collected during earlier coastal projects between 1993 and 1997 were integrated with the data collected by the ongoing Arfordir project to provide a GIS layer of known coastal sites which could be printed off as maps for volunteers.